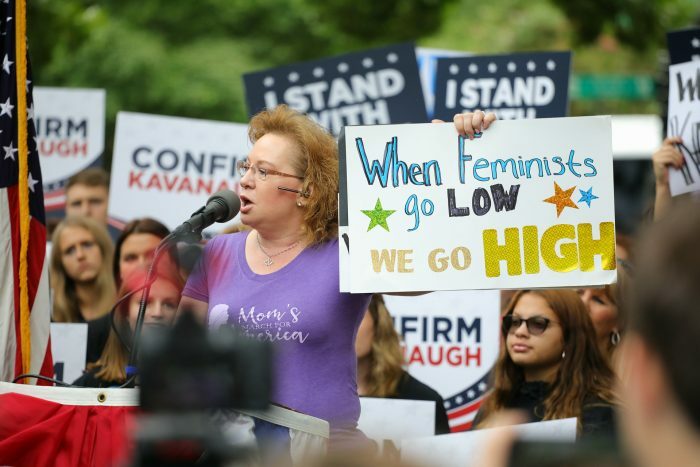 A coalition of conservative women’s groups and Liberty University students rallied on Capitol Hill this morning in support of Supreme Court nominee Brett Kavanaugh ahead of Christine Blasey Ford’s scheduled testimony during which she said that Kavanaugh sexually assaulted her in 1982, while he was drunk at a party. Both attended high school at the time. The event was billed as a “grassroots” support rally for Kavanaugh, but the women gathered at the rally were slightly outnumbered by young men in attendance. 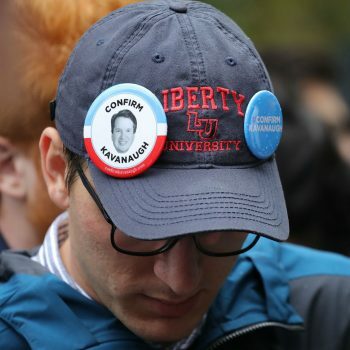 Three hundred student participants had been bused in from Liberty University, half of which had their accommodations paid for by Concerned Women for America. According to a Facebook event page for the trip, Liberty University students who attended that rally received an “excused absence from class and a free trip to DC.” At one point, the students were asked to raise their hands, revealing that they comprised a majority of the crowd. The event was emceed by Penny Young Nance, CEO and president of Concerned Women for America. CWA earned recent press recently for its sponsorship of a “Women for Kavanaugh” bus tour, especially in light of recent accusations. Peggy Nienaber, vice president of operations at Faith & Action, a ministry that she said preaches to “the elected officials, throughout the Supreme Court, and to anyone on the streets,” opened the rally in prayer. “Pray for the accused!” a rally attendee yelled out after Nienaber closed her prayer. 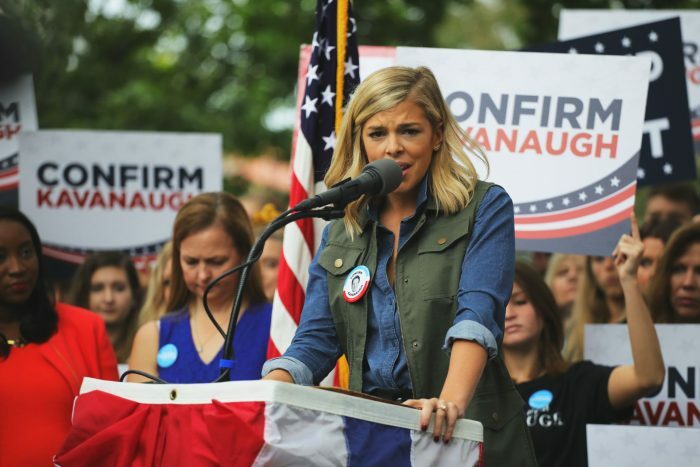 CRTV host and conservative commentator Allie Stuckey said that those who oppose Kavanaugh don’t actually believe that Kavanaugh may have sexually abused Blasey Ford and others, but rather they were afraid that Kavanaugh would overturn Roe v. Wade. “No later than tomorrow, we need to confirm Kavanaugh,” Stuckey said. Chants of “vote, vote, vote,” briefly broke out among those in support.